Achy joints have a way of slowing people down and for some, provide an excuse to not exercise. 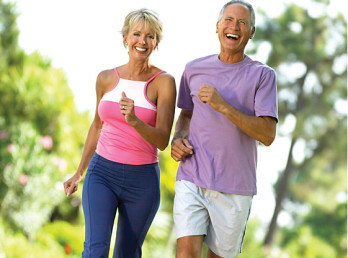 However, inactivity can actually be worse for aging (er, achy) joints as movement of any type is better than no movement. Joints contain fluid and movement actually helps to lubricate the joints, making them function more smoothly and helping to counter joint stiffness. In addition, resistance training will help build muscle, which in turns helps with movement of the joints. Here are some guidelines to follow to get and stay on that fitness track, no matter what your joints say. No need to stop exercising. Instead, stick to low impact exercises. Walking, hiking, stair climbing, biking, swimming and dancing are all good low impact choices. There are also lots of cardio machines at the gym to choose from that will give you a low impact workout, including striders, ellipticals and stationary bikes. Group exercise classes like yoga or Tai Chi are also great choices. Exercises to avoid: running, basketball, tennis, racquet ball or hand ball. Don’t forget to include resistance training in your routine. Regular resistance training builds the muscles around the joints, taking some of the pressure off of the joint itself. No need for heavy weights – that might result in increased joint pain. Low weights with higher repetitions do the trick. Remember, resistance training is not only lifting weights. Other ways to incorporate resistance training include doing body weight exercises or using a fitness band for resistance. The result is the same no matter what the method. Another form of exercise that is easy on the joints is isometric exercises. The word isometric means same length, and literally means performing an exercise where your muscle length does not change. One example of an isometric exercise is holding your arms at your sides and flexing then relaxing your biceps without bending your arm. Contracting a muscle without movement takes practice, but can be done for any muscle. Stretching is also important to alleviate stiffness in joints and improve flexibility. Include daily stretching for best results. Not sure how to resistance train? Need help setting up a fitness routine or learning what isometric exercises are best for you? Let Mile High Fitness & Wellness personal trainers help teach you some exercises, including proper form. Contact us for a free consultation. No matter what you limitations are, Mile High Fitness & Wellness trainers can help you develop a fitness routine that will benefit your health and fitness.